At the foot of the hill on which sits the ancient city of Cumae, in the region of Naples, Priscilla Munzi, CNRS researcher at the Jean Bérard Centre (CNRS-EFR), and Jean-Pierre Brun, professor at the Collège de France, are exploring a Roman-era necropolis. They now reveal the latest discovery to surface in the archaeological dig they have led since 2001: a painted tomb from the second century B.C. In excellent condition, the tomb depicts a banquet scene, fixed by pigments. Twice the size of Pompeii, the ancient city of Cumae is located 25 km west of Naples on the Tyrrhenian Sea facing the island of Ischia, at the Campi Flegrei Archaeological Park. Ancient historians considered Cumae the oldest Ancient Greek settlement in the western world. Founded in the latter half of the 8th century B.C. by Greeks from Euboea, the settlement grew quickly and prospered over time. 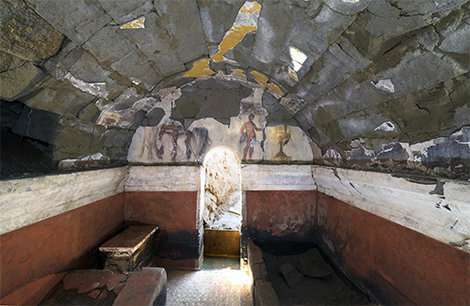 Until now, only tombs painted red or white had been found, but in June 2018 researchers discovered a room with exceptionally executed figure painting. 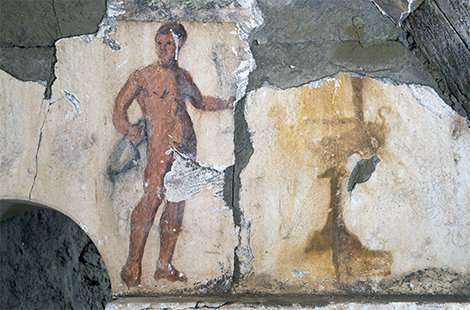 A naked servant carrying a jug of wine and a vase is still visible; the banquet's guests are thought to have been painted on the side walls. Other elements of the banquet can also be distinguished. In addition to the excellent state of conservation of the remaining plaster and pigments, such a décor in a tomb built in that period is rare; its "unfashionable" subject matter was in vogue one or two centuries earlier. This discovery is also an opportunity to trace artistic activity over time at the site.